RDLN women at the NGO meeting in on Women in China. 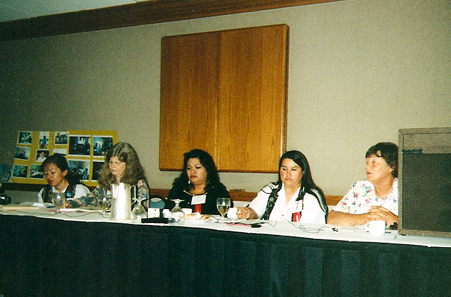 RDLN Network members at Association for Women and Development (AWID) conference in Washington, DC in 1996 (l to r, Mily Treviño-Sauceda, Starry Krueger, Francisca Cavazos, Julie Moss and Marge Townsend). 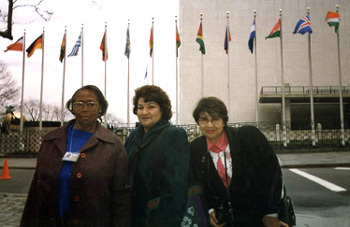 Rennie Miller (AL), Anita LaRan (NM), and Virginia Ortega (CA) at the United Nations RDLN presents a workshop each year during Commission on the Status of Women session. 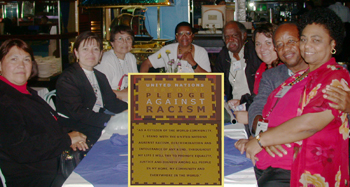 See CSW 2003, 2005 2006, 2007, 2008, 2009, 2010, 2011, 2012, 2013, 2014, 2015, 2016. 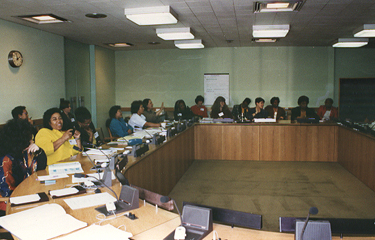 RDLN co-sponsored a discussion of Women in Agriculture with Women, Food, and Agriculture and the United Nations' Food and Agriculture Organization (FAO). 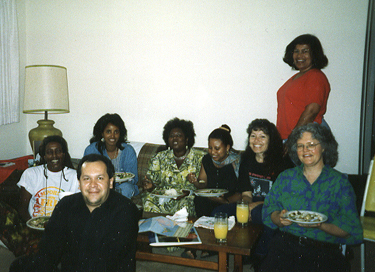 Exchange with people from other countries at the RDLN Institute in California: Back Row: Tang Cao (China), Janet Momsen (UC Davis Cooperative Extension), Fe Sarmiento (Philippines), Sarmaria Archila (Columbia), Shirley Sherrod (RDLN Board Member and graduate, GA), Mike Acosta (RDLN Leader, TX). 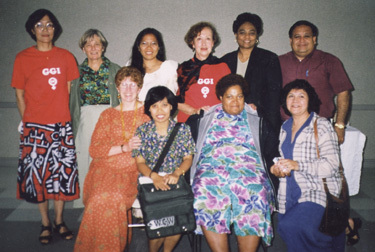 Front Row: Peggy Swain (Gender and Global Issues, UCD), Sih Handayani (Indonesia), and Twila Martin-Kekeahbah (RDLN Board Member, ND).